Visit Jewelcase Slipcase Packaging on our Main Site! Adding a slipcase to your jewelcase package takes your product to a new level. Jewelcases are very common- it's easy to get lost in the crowd. What will make yours title stand out and say "WOW"? Yes, indeed...a slipcase! Slipcases make the jewelcase package more impressive, more substantial (i.e., worth more), more artistic, more visible, and gets more attention. What does this mean to you? Slipcases are fully printed (4C) and available in various styles including side or top loading, tube or box, and with or without thumbnotches. You can even add die cut windows. Their generous spine area gives you room to make a real impression on the rack. Popular printing effects on slipcases include Embossing, Debossing, Metallic Inks, Spot UV Gloss, Matte Lamination, and Hot Foil Stamping. We know how to make that WOW package! Build your Slipcase Set below. Choose disc type & multi-disc options, jewelcase type, slipcase type, printed inserts & booklets and finish with special features such as varnishes, embossing, and metallics. All the choices you could wish for. And don't forget - all Megalodon replication projects include our Exclusive Proof Disc (we set up the press, manufacture your disc, print it, and send it to you for review) - free of charge. It is the only way to guarantee the discs see, look, hear, play, perform, and test out exactly as you intended. You have to have an actual pressed disc, complete with printing. Without it, you're running blind. Did we mention other goodies such as 5C offset discs so you have gorgeous discs as well? Worried about the paper printing proofs - no problem, complete with hardcopy matchprints sent to you. See our procedure and what's included with each order. Instructions: To build your package, choose quantity, disc, packaging, and assembly. Your final product can be modified to add extra discs, customized with special printing effects, modify packaging style, add booklets, etc. Feel free to use Project Notes below for clarification or if you get stuck. Includes the manufacturing of pressed discs & disc printing. Pressed discs- injection molding, (i.e., substrate is poured out into mold), metal layer with data is formed with metal stamper (made from glass master made from client master). Recordable DVD-Rs are made with a special layer that allows you to write the content. You may want to use DVD-Rs if you have a special need like frequently changing data. Mini DVDs are 8cm round DVD5s. Clear Substrate Discs - uses a mini disc mask with clear substrate out to the edges. Data Size will be small, physical size the same as a standard full size dvd. Includes the manufacturing / data replication / pressing of discs from your supplied master. Provided (pressed & printed) for your approval. We set up the press and manufacture & print your proof disc. It is the only way to make absolutely certain that it's perfect. We'll send to you for approval. Please specify type of disc(s) and number of each type you need in each set. 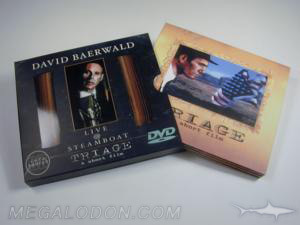 "1 mini DVD & 1 mini CD"
We produce film for your project to ensure the highest possible quality printing on disc & packaging. Printed test disc with data for you to test, and a color matchprint to check packaging art. Proof Set is FedEx'd to you. No need to return, it just needs your approval. Other insert type, such as stapled booklet with one or more flyouts, etc. Use Project Notes below. Insertion of disc & shrinkwrap. insertion of disc & NO shrinkwrap. There are many modifications that can be made. Pocket styles & designs are easily modified, often without charges. Special printing effects can also be added. Standard schedule is 2-3 weeks proofing / production. Rush schedules are available, without charges. We'll need to know dates. Do you need address stickers, barcodes (complimentary) or distribution help? OK! I'm done for now and just need the production costs please! In-Hand Need Date Is there a backup date at an alternate address? Do you have a distribution partner preference that you'd like us to include and drop ship cds to? We offer a large number of distribution partners (over ten). Go to our distribution page and see if any of them are right for your project. They vary from audio to film titles, some help take orders and do the fulfillment, some let you take the orders and do shipping, some help with promotion to major sources, and some help with financing (independent films for example). We can drop ship to them or cover inclusion fees for you. Do you have a bulk mailing permit and want us to drop off at post office? Do you need dress labels or stickers or envelopes? "Send Quote Request" will get the ordering process started by sending an email to us. We'll be in touch with you, either by phone or email, to get details, shipping, and schedule squared away. all discs are pressed (data & printed) , unless noted as a special recordable product. What is it like to work with megalodon? Ask our clients, we're a differnt kind of company.